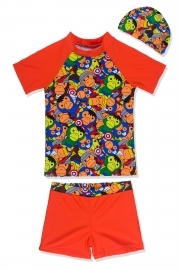 Rash guard with short sleeves, high neck design, keep kids boys in sun protection. 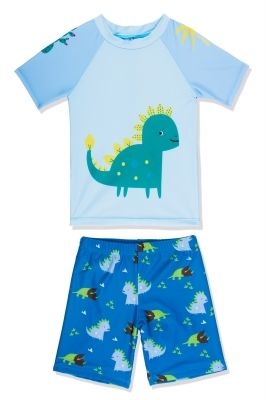 Dinosaur printing and 3D dinosaur tail effect, suitable for toddlers and boys. Cartoon designs make your boys more cute and energetic. Our swimsuit comes with two-pieces rash guard design, adorable dinosaur pattern, along with 3D effect. 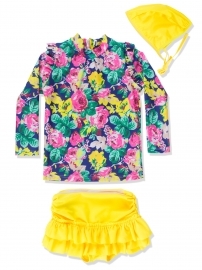 This swimwear is available for toddlers from 2 years to boys up to 15 years. Notice: There is 1-2 inches differences because of different measuring methods. Please check the size info carefully. Thank you for your understanding.